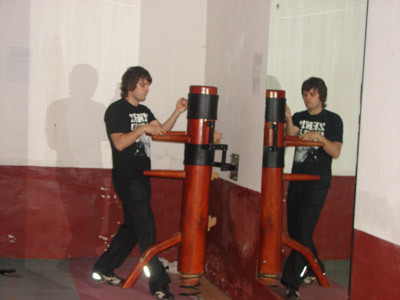 Andrea returned to study kung fu in May 2011. 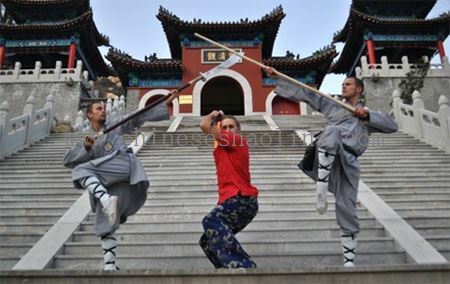 My martial arts experience in kunyu shan shaolin kung fu academy China.My kung fu training is really good and I like to learn it because we do different things and also I learned different Chinese martial arts .I have been here for 7 months and I can feel my body more flexible more fast and more powerful. The masters are amazing. I never met anyone in life so knowledgeable. I appreciate all the knowledge masters have given me. They have left a great impression. Due to my experience I am planning to come back next year. Some translators work very well,the surroundings of kung fu academy are beautiful. It reminds me of paradise. I enjoy the daily life in training very much. I enjoyed most of the academy because the rooms are comfortable, I am Italian I enjoy good tasting food. The food here is good,it is best if they constantly serve the various food. The city we located,Yantai city, is a good area to go shopping or have a nice time. They seem to have lots of things to do and is very big. The life in your academy was great. All people are very nice like a family. Good spirit on your academy. 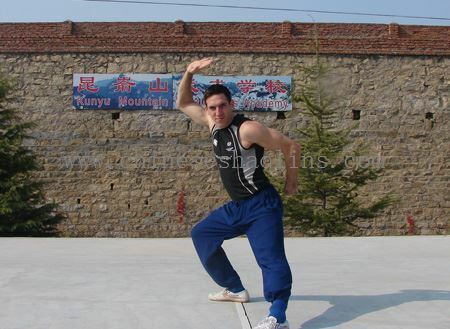 From the first day I came kunyu kung fu school, I saw that training at Kunyu Shan was serious and that’s what I wanted. I was given a kung fu master that I really care for and has helped me to find out that what I thought were my physical limits. And I, with the help of my master, was able to go much further. I really liked the shaolin kung fu training. When I came I couldn’t defend myself, but now I’m much more relaxed and not as afraid. Translators were all really nice, friendly and helpful. Daily life is good at Kunyu Shan. It takes about 2 weeks to get into routine, but after that it is very relaxing not having to worry about cooking and the food is still good. I also liked that there is variety in the vegetarian food, which is really good. The surrounding of the academy is beautiful. The Master is very good, always funny and happy. I learned from my master many good thinking ways and get more confidence. Now I am like my master, always happy, enjoyed life.and the kung fu training transforms me. I changed. Translators are very nice.Daily life is okay. Weekend is good. People are friendly and communicative. I like atmosphere in kunyu martial arts academy. Mountains in the surrounding are good for training. I like running on the mountain path and all the training.There are many interesting thing in Yantai city including sea beaches, shops and clubs. I think traveling in yantai is a good thing. My overall impression of the kunyu mountain shaolin kung fu academy is a good one. The kung fu training is difficult, but is exactly what I wanted. I enjoyed how the daily training was beautiful also. The mixture of Shaolin in the morning and Sanda Boxing in the afternoon made for a well rounded day of training each day. I generally felt that every master here cared for each student and their progress. The masters understand that not everyone is at the same level experience, wise or fitness wise. They understand and work with that student. Master Rong was wonderful. I can’t express in this short paragraph how thankful I am to him for his time. Thanks to all the translators for your help. I enjoyed my time here. Not much to say about the mountains surrounding the academy. They are simply amazing. They turned this into an experience I will never forget. Playing here is great also. I met new friends from all over the world. This place felt like home. Yantai is a wonderful city. Where else in this part of China I can get my monthly McDonalds. 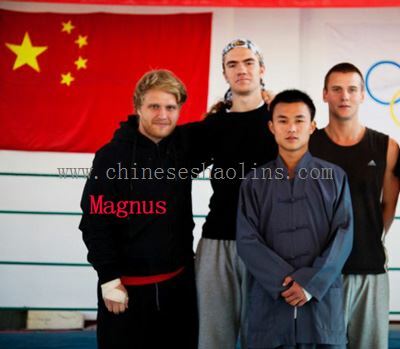 Overall it was quite an amazing kung fu training experience .Especially with all the masters and the translators. My shaolin master was a very good person who taught me many things that will be with me in the rest of my life. Although he was a little harsh ad times he still helped me a lot and I benefited a lot from him. The translators were very nice as well. They even took their time off to give me extra Chinese lessons and they were really patient and enthusiastic while teaching me Chinese. Even during training they translated clearly and secretly cheered for us when we were down. The trainings and stuff were all really good as the students in the academy were really nice to each other and built strong relationships with each other. The academy has all the essentials we need for training as they provide good environment for daily training. YanTai city was a beautiful city with lots of things to see. They had many special things to see. The kung fu academy is located in the middle of beautiful mountains. The surroundings are very peaceful, which helps in focusing on your gongfu training. The kung fu training is good, my fitness has improved greatly and there is the opportunity to train in different classes all day if you wish. It depends of course on the student as to how much benefit is taken from the training. I worked with Master Rong and am grateful to have had that opportunity. He has a fantastic blend of knowing when to be serious and when to be fun and when to be respect of his students. They trust him and appreciate his skills in both Martial Acts and teaching. The translators are nice people and it is helpful to have them. I hope their English continue to improve as it is a different job, and an important one. The surroundings of the Academy are perfect with mountains all round. The road outside is quiet, making it a wonderful place for study kung fu. There is a strong structure to daily life and the students get on well with each other. There is respect for the masters and the academy is very well run. Yantai’s beautiful city by the sea. My experiences in Kunyu mountain shaolin kung fu academy. My son and I are very happy to stay for 4 weeks in academy. All is very perfect. I encourage any person to go at this academy. The most important is the serious of the masters. They are careful for each student and the translators are with you any time. They are sympathized and if you need any helping they are intensive. The kung fu training is difficult but quickly you will see your progress. Do not forget this is Kung Fu Academy, not a holiday center! My son want come back for stay a long time. We thank very much all the staff of the Academy. My experiences in Kunyu mountain shaolin martial arts academy. The kung fu training is good and demanding. If one has previous martial arts experience, it will still take a while to adapt. One needs to dedicate all himself to improve and become a better martial artist. The masters are incredible, their abilities are imaginable and their knowledge is more than deep.It takes a lot to train under somebody who is too much better than oneself but eventually one learns oceans of things from them. The translators are helpful, usually they are ok.The daily life is simple and helps focusing on the training.The surroundings of kunyu mountain kung fu academy are nice, mountains, lakes and a couple of temples give some pleasant spots to go to during weekends. YANTAI, the city that school located is a nice coastal city to visit. Most of the people go there for shopping, massages and clubbing. I spent one month in the Kunyu Shaolin martial arts Academy. I wanted to push my limits and I found what I was looking for. The martial arts training is not easy but with a daily practice. I gain most flexibility and become more resistant. Concerning the technical training, my master is very competent, and with the help of the translators, he can explain and show us every detail of the forms. 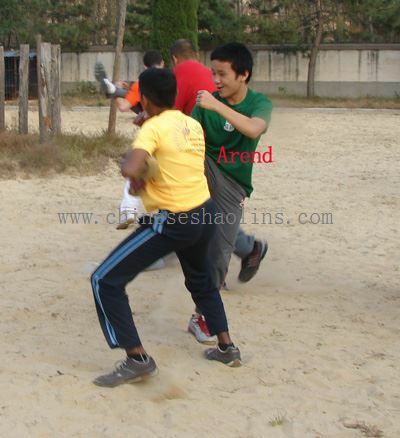 The sanda(Chinese kickboxing) training is very use full as well and gives good basics for fight. The internal martial art is very interesting too but one month is really too short to learn all these techniques. Inside the shaolin academy, the atmosphere is pleasant and focus on the kungfu studying. The rooms are modest but comfortable enough. The food is very good especially the dumplings, yummy! Thanks to the cook and the kitchen staff! As far as training, KUNYU Shan(mountain) martial arts academy has been much better than I expected, Mantis and BA GUA are traditional systems, in a very complete way. 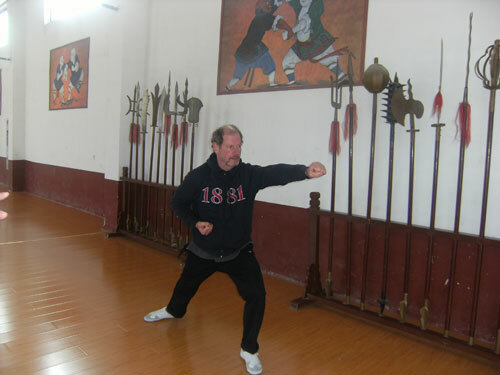 The training is varied and covers all aspects: conditioning, power, endurance, form, application, sparring, qigong etc.I found master QU to be one of the best masters I have ever met, in China and abroad. He will continue to be my good friend for life. He has always taken the time to help me out and gives everything he has to his students. I would also like to thank master Guo, he has put a lot of effort into the Qigong and TAIJI and made sure I understood everything. He has also given me much more knowledge than most. I am very grateful to him. The translators have always been very helpful and friendly. They are all very nice people and I am glad to have them around. The daily life of the academy is generally very good, I feel the Academy has a very good atmosphere and I have enjoyed it a lot. 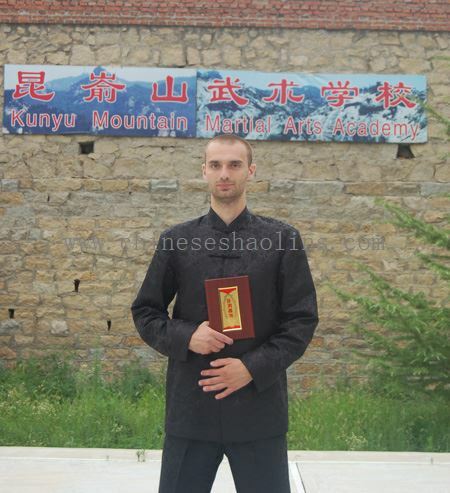 I have completed my year in China kunyu mountain shaolin martial arts academy. I am satisfied with not only training but living facilities and academy’s effort to help me.Master big Wang and master Zhang trained me, they were strict and always pushed me beyond my limits. They made me understood martial arts is about hardwork, dedication, patience and being spiritual.Although I didn’t understand Chinese language, it was due to help of translators that I was able to communicate with them well. 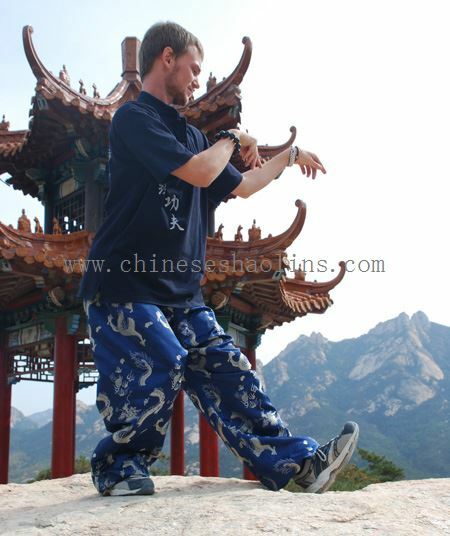 The shaolin kung fu Academy is located near lake, in between mountains, beautiful place to be around. It never gets bored as masters always keep improving training plans. They take you to river or mountain to do meditation class or running. Yantai is the city that school located,it is located near ocean, and weekend life could be quit chilled out. One can go and make many Chinese friends and understand Chinese culture or life from near. The kung fu training was very interested! All the masters are very knowledgeable, skillful and well discipline! They try to caterd to all level of students, at the some time maintaining the quality of teaching. Even though I was here for a short period of time, however, I will never forget the teaching I received from “Master ”, for the rent of my life. Thank you Master Rong! Yantai is a great city,we can visit during the weekends. Coming to the Kunyu Mountain Martial Arts Academy was a life-changing experience for me. I came with no martial arts experience and expected to get a good first impression of it in the time I would be here. But that was way under estimated. Next to learning how to fight, how to control your body, gaining flexibility, I made a lot of interesting friends and built up an amazing relationship with my master. 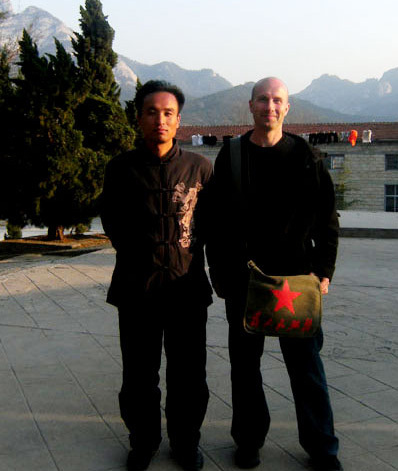 Being a student in Master zhang’s shaolin group gave me even more than I hope to expect. In the form lessons, next to basics, I learned lots of kungfu, acrobatics and even an animal form. Furthermore, my master gave me an example and taught me the real spirits of martial arts. How you train and how you show respects and get respects at the same time. In total, I have to say that I leave as a changed person not just physically but also mentally. I will leave this academy happily with a clear, calm, relaxed and sober mind but also sad to leave an epic, spiritual place like this. I will miss the training, the people, the atmosphere and especially my master, which will make me definitely come back next year. I have greatly enjoyed my time here at the academy. The masters have been extremely understanding in accommodating all the different styles that I wished to learn, and especially it meant a lot to me that Master Zhang was prepared to teach me the fan form during my time here. I feel that I have learnt so much from my time here, that I am leaving the academy determined to keep training and learning martial arts, and in time return to the academy again to learn more from masters. I feel grateful to have had the experience of training here, and am very sorry to be leaving the school and all the friends I have made here. Apart from all the aches and pain, I enjoyed every second of it, I love train hard and felt I was really pushed hard everyday. I can’t wait to come back! Life in the school was pleasant, there is a friendly environment, the rooms were adequate and the masters seemed to deal with all the problems as soon as they arrived.I went to all the extra classes, but sometimes still felt I could have done more, if possible. All three of my masters were excellent! A special thankyou to my Shaolin and Baji/ Taichi master. They really cared about my progress and helped me achieve more. Thank you! And a huge thankyou to all the hard-working translators. I enjoyed discovering traditional martial arts. Thanks to our master, Master Wang who helps students to improve and teach them discipline and respect of rules with educational methods. I think his way of doing and living, corresponds to the academy’s way of teaching. I appreciated the rules of the academy: no smoking, no drinking, closing hours for evening, cleaning……which are really useful and essential. The natural environment around the academy is also amazing, so I enjoyed outdoors activities in the National Park and to the Temple. Kunyu Mountain martial arts academy is a nice place. 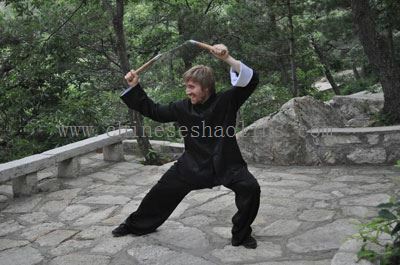 The masters taught me a very good way of Chinese Martial Arts, their demonstration was amazing. I liked all the exercises we did. The power training was very good to improve my mental and also my muscles. And the power stretching, I think was painful, but very good to become as flexible as masters. To finish, all the other students were nice and the translators did a great job here. I stayed at kunyu martial arts academy for three months kung fu training,it was most pleasant three months in my life. The shaolin masters are all come from the shaolin temple and the class is well banlanced,masters always listen to you and are very patience with the students and kung fu training.Master Wang is a very good master who understands and accepts to the problems of his students,He combines a relaxed and very good mood while remaining serious and keeping his role of master. The translators are generally available, the academy is in the middle of the kunyu mountain with the beautiful river and the lake,this is an ideal place to learn Chinese martial arts ,the school staff are really pleasant,I am very enjoy my learning at kunyu kung fu school. The city we located is very beautiful and clean , this city as well makes it possible to relax at the beach, go shopping on to go out with friends on weekends. First of all, I’d like to mention that I had a wonderful time here. Being here was a great experience due to awesome people at the academy and the masters. I really had a great stay! The academy has a hostel-like quality including its own shop with plenty of offer. The food is healthy and pretty alright. Pretty much all facilities at the academy are good! Overall, I had a fantastic time here, partly thanks to the staff at the academy, and I am considering returning for a longer period of time in the future. My experiences in kunyu mountain shaolin school.I have trained kung fu here for 12 months,I can honestly say it has been the best 12 months of my life.The training can be hard at times but is very enjoyable at the same time,it is truly amazing. I trained for the majority of my time here under Master Wang，he is not like anyone I have ever met before,his technical ability knowledge and skill is perfect ,but what really sets him apart from everyone else is his complete 100% commitment to his students and the enthusiasm he has for training transcends into everyone he teaches.He is a very special person and no words can be enough to describe how much appreciate all he has done for me,Thank you ShiFu! The academy in general caters well for the western students,the weight training equipment is good,the surrounding area is absolutely beautiful and very relaxing and peaceful. Robert is in the middle of this picture. Travelling to China kunyu mountain Shaolin Kung Fu school ,I enjoyed the kung fu training here.There was a good balance in all of the classes. It was a privilege and pleasure to learn mantis with master in the Mantis class.Master Qu is very skilled and helps the students with great patience and commitment. 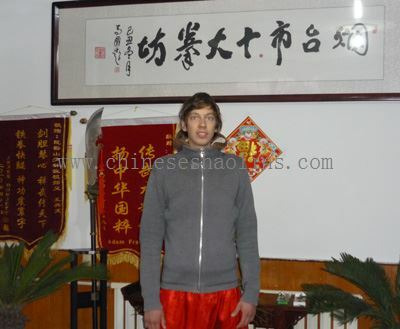 All the translators are very helpful and capable and nice.Daily life in the kung fu academy was very pleasant.The surroundings of the academy are very suitable and nice,all of the masters and staff of the academy were excellent. 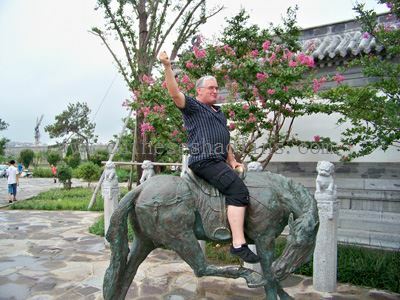 I enjoyed visiting the yantai city at the weekend sometimes,the local taxi drivers at the academy were very helpful. Learning kung fu in China kunyu mountain shaolin kung fu school from March to May.I am really enjoyed Master Guo’s kung fu training program, the big advantage of this program is combination of two martial arts:Wingchun and Baji, the fusion of this martial arts is very effective and unusual. Aslo I can say only the complimentary words to master Guo ‘s teaching skills,He know exactly what to do ,to make students level increase quickly, He is real professional and he is really devoted to his teaching.That was honour and great pleasure for me ,to learn Chinese kung fu under his guidance. I am very happy with my time spent at Kunyu Mountain Martial Arts Academy. The training Master Guo provided was excellent. I spent two months at another shaolin martial arts academy in northern China before coming to the academy and the Kunyu Mountain academy is much better than that one. If I get some time off work in the future I will definitely come back to the academy for future training. I am 64 year old from France,I attended the Kunyu Mountain Shaolin Academy just for one month because of some problems with my bad knees. I appreciate a lot my staying in Shaolin Martial Arts Academy. I came here more for my mind than for sports and I found what I were looking for: Peace with myself. It was one of the most enjoyable one month in my life. I thank a lot all the people I was involved with: smiling translators and masters. Special thanks to master Wang Xing Long who taught me some Qigong movements with great patients, which, I hope, I will not forget. Sam (Australia)February,2009-February,2010 Third time to Come! I have stayed at Kunyu mountain shaolin martial arts academy for one year and it has been one of the most memorable experiences of my life. I would recommend this academy to anyone who has interests in martial arts. Whatever you are a novice or an accomplished martial artist, you will gain something here to suit everyone. The school is continually making efforts to improve having added new floors, showers and editions since my arrival. The masters here are true masters in every sense of the word and are amazing teachers, martial artists and people. A special thank to little Wang (Shi Yong Po) who is an inspiring master and with his encouraging, firm and benevolent nature has given me a great boost in my martial arts progress and is the reason I will be returning as soon as possible. On the scale of 1 to good academy, that is, a good academy! The thanking letter for the school written by the students. This is just a quick note to say thank you for everything you have done to make the Holiday Season an enjoyable time for the students at this school. Both the Christmas dinner and the New Year’s Eve feast were very nice. Thank you for both. Thank you for the Christmas present! Very tasty! I hope you all had a lovely Holiday Season.